The original Dodge Viper was hailed as a concept car for the road, a 1960s throwback with 1990s performance. But there was at least one little detail that didn’t transfer from concept to production. 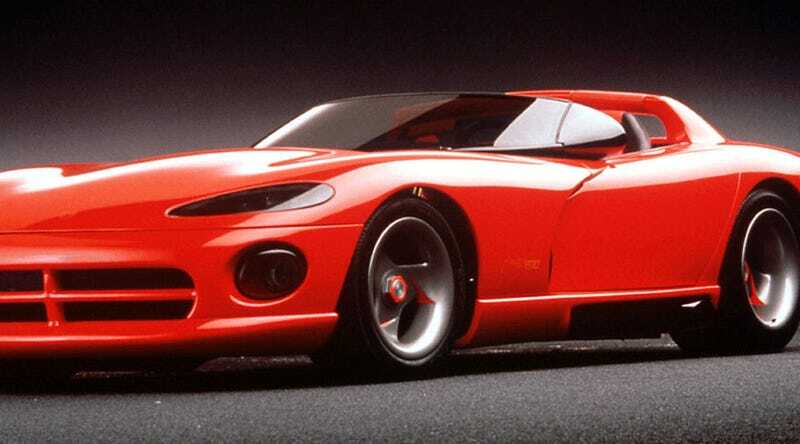 Above is the Dodge Viper R/T10 concept car, built in 1989. This was after the idea of a V8 engine was rejected, but before the car was approved for production, before the car was tested for production, before the car actually started shipping out to customers all the way in the start of 1992. ...the side mirrors integrated into the windshield. Never have I seen such masterfully and beautifully designed and integrated door mirrors as these. Let’s enhance. And yes, they are actually door mirrors. These things may fit flush with the speedster-style cut-down front glass, but they’re actually mounted directly to the door itself. The fitment is extremely choice. Here’s the-man-shut-out-from-Ford Lee Iacocca showing off how that worked back in early ‘90. You can see the ( shaped mirror above. What is Lee doing with his tongue there? I do not know. Is it a snake thing? Maybe it’s a snake thing. Who is to blame him, that car is sweet. Now, not every pre-production Dodge Viper had this treatment. In fact, only this ultra-early show car did, along with some early clay modeling. That’s a bummer. But really, it’s those mirrors that I wished had made it onto the road. So cool.